The next significant shift in political thinking will occur when candidates and citizens understand that the existing social, economic, and political structures are not natural laws and do not bind us to a fate outside of our control. Our present legal structure stems from our Constitution, a document that was a profound reimagining of social, economic, and political structures. In a previous blog post, we argued that a strict and literal interpretation of a document written in 1778 to settle legal disputes is an unjust action against the citizens of 2018. If we view the Constitution as a social technology, we can begin to imagine alternatives that would better empower the collective citizenry of today. 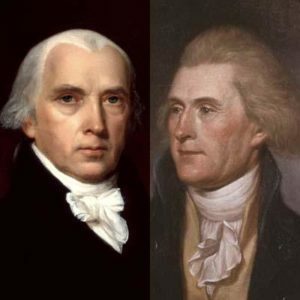 During the development of the Constitution Thomas Jefferson proposed that the document should be revised every 19 years, a number that reflected the span of a changing generation in 1778. The most evident concept for institutional reformation would follow the advice of Thomas Jefferson. We (the government) could facilitate a public constitutional convention forming a cooperative chain of communication progressing from the municipalities to the state and from states to the Federal Government. Public feedback could be provided through a very secure digital channel or the traditional paper ballot method, to prevent interference. The voting day could be declared a national holiday and all citizens could be required by law to participate under the pretense of monetary penalties such as those used in 31 other democratic countries. Before the voting, a free, open, and transparent platform could be created to discuss the issues in a format focused on the suggested revisions based on facts and data. Proposed changes would be required to be submitted in a detailed analysis, concise but accurate summary, and a video format as well. The public could hold discussions about the proposed resolutions via the online platform that would be moderated for accuracy and factualness – allowing for public questions and professional responses. One of the best examples of forum moderation I have witnessed can be found at r/NeutralPolitics. If we wanted to ease into the process, we could initially constrain the number of potential changes for the initial vote and devise a system that filters ideas to vote on by best of a category chosen by the public via the platform or a pre-vote to determine the actual issues. Since this situation would arise once every 20 to 30 years, I imagine we could agree that two additional national holidays are acceptable. The platform could be a publicly owned and funded asset that is subject to strict transparency regulations and information audits. This solution works because it raises overall citizen engagement in democracy and provides easy and convenient access to the information necessary to make an informed decision. This rethinking of our constitutional legal basis could be argued as a traditionalist method as it was one created by one of the Constitutional founders. Arguments against this proposal in favor of a more traditionalist approach of rigid constitutional interpretation would struggle against the hypocrisy of denying one aspect of American history while embracing another that suits their desires. What excites me about this concept is that, from a technical standpoint, this is readily achievable today with the appropriate funding and public support. Viewing social structures as instruments requiring innovation and improvement will become increasingly necessary throughout the United States, and the globe, as the exponential trends in technology continues to accelerate. A proactive approach today is a superior solution to a reactive approach when a crisis occurs in the future.